All of the compound data types we have studied in detail so far — strings, lists, and tuples—are sequence types, which use integers as indices to access the values they contain within them. Dictionaries are a different kind of compound type. They are Python’s built-in mapping type. They map keys, which can be any immutable type, to values, which can be any type, just like the values of a list or tuple. As an example, we will create a dictionary to translate English words into Spanish. For this dictionary, the keys are strings. The key-value pairs of the dictionary are seperated by commas. Each pair contains a key and a value separated by a colon. The order of the pairs may not be what you expected. Python uses complex algorithms to determine where the key-value pairs are stored in a dictionary. For our purposes we can think of this ordering as unpredicatable. Dictionaries have a number of useful built-in methods. The keys method takes a dictionary and returns a list of its keys. As we saw earlier with strings and lists, dictionary methods use dot notation, which specifies the name of the method to the right of the dot and the name of the object on which to apply the method immediately to the left of the dot. The parentheses indicate that this method takes no parameters. A method call is called an invocation; in this case, we would say that we are invoking the keys method on the object eng2sp. As we will see in a few chapters when we talk about object oriented programming, the object on which a method is invoked is actually the first argument to the method. Because dictionaries are mutable, you need to be aware of aliasing. Whenever two variables refer to the same object, changes to one affect the other. We only need three key-value pairs, one for each nonzero element of the matrix. Each key is a tuple, and each value is an integer. Notice that the syntax for the dictionary representation is not the same as the syntax for the nested list representation. Instead of two integer indices, we use one index, which is a tuple of integers. get definitely improves the semantics of accessing a sparse matrix. Shame about the syntax. If you played around with the fibonacci function from the last chapter, you might have noticed that the bigger the argument you provide, the longer the function takes to run. Furthermore, the run time increases very quickly. On one of our machines, fibonacci(20) finishes instantly, fibonacci(30) takes about a second, and fibonacci(40) takes roughly forever. 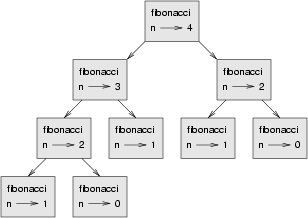 A call graph shows a set function frames, with lines connecting each frame to the frames of the functions it calls. At the top of the graph, fibonacci with n = 4 calls fibonacci with n = 3 and n = 2. In turn, fibonacci with n = 3 calls fibonacci with n = 2 and n = 1. And so on. Count how many times fibonacci(0) and fibonacci(1) are called. This is an inefficient solution to the problem, and it gets far worse as the argument gets bigger. The dictionary named previous keeps track of the Fibonacci numbers we already know. We start with only two pairs: 0 maps to 1; and 1 maps to 1. Whenever fibonacci is called, it checks the dictionary to determine if it contains the result. If it’s there, the function can return immediately without making any more recursive calls. If not, it has to compute the new value. The new value is added to the dictionary before the function returns. Using this version of fibonacci, our machines can compute fibonacci(100) in an eyeblink. The L at the end of the number indicates that it is a long integer. Python provides a type called long that can handle any size integer (limited only by the amount of memory you have on your computer). In Chapter 7, we wrote a function that counted the number of occurrences of a letter in a string. A more general version of this problem is to form a histogram of the letters in the string, that is, how many times each letter appears. Such a histogram might be useful for compressing a text file. Because different letters appear with different frequencies, we can compress a file by using shorter codes for common letters and longer codes for letters that appear less frequently. We start with an empty dictionary. For each letter in the string, we find the current count (possibly zero) and increment it. At the end, the dictionary contains pairs of letters and their frequencies. In this case study we will write a version of the classic console based game, robots. Robots is a turn-based game in which the protagonist, you, are trying to stay alive while being chased by stupid, but relentless robots. Each robot moves one square toward you each time you move. If they catch you, you are dead, but if they collide they die, leaving a pile of dead robot junk in their wake. If other robots collide with the piles of junk, they die. The basic strategy is to position yourself so that the robots collide with each other and with piles of junk as they move toward you. To make the game playable, you also are given the ability to teleport to another location on the screen – 3 times safely and randomly thereafter, so that you don’t just get forced into a corner and loose every time. Programs like this one that involve interacting with the user through events such as key presses and mouse clicks are called event-driven programs. The event handling is done inside the move_player function. update_when('key_pressed') waits until a key has been pressed before moving to the next statement. The multi-way branching statement then handles the all keys relevent to game play. Pressing the escape key causes move_player to return True, making not finished false, thus exiting the main loop and ending the game. The 4, 7, 8, 9, 6, 3, 2, and 1 keys all cause the player to move in the appropriate direction, if she isn’t blocked by the edge of a window. Now let’s add a single robot that heads toward the player each time the player moves. We need to pass both the robot and the player to this function so that it can compare their locations and move the robot toward the player. Now add the line robot = place_robot() in the main body of the program immediately after the line player = place_player(), and add the move_robot(robot, player) call inside the main loop immediately after finished = move_player(player). We rename the variable finished to defeated, which is now set to the result of collided. The main loop runs as long as defeated is false. Pressing the key still ends the program, since we check for quit and break out of the main loop if it is true. Finally, we check for defeated immediately after the main loop and display an appropriate message if it is true. give the player the ability to teleport to another location to escape pursuit. provide safe placement of the player so that it never starts on top of a robot. Adding the ability to teleport to a random location is the easiest task, and it has been left to you to complete as an exercise. How we provide safe placement of the player will depend on how we represent multiple robots, so it makes sense to tackle adding more robots first. Add move_robots immediately after move_robot, and change play_game to call move_robots instead of move_robot. Add check_collisions immediately after collided and change the line in play_game that sets defeated to call check_collisions instead of collided. Finally, we need to loop over robots to remove each one in turn if defeated becomes true. Adding this has been left as an exercise. The biggest problem left in our game is that there is no way to win. The robots are both relentless and indestructible. With careful maneuvering and a bit of luck teleporting, we can reach the point where it appears there is only one robot chasing the player (all the robots will actually just be on top of each other). This moving pile of robots will continue chasing our hapless player until it catches it, either by a bad move on our part or a teleport that lands the player directly on the robots. Check whether the player has collided with a robot or a pile of junk. If so, set defeated to true and break out of the game loop. Check each robot in the robots list to see if it has collided with a pile of junk. If it has, disgard the robot (remove it from the robots list). Check each of the remaining robots to see if they have collided with another robot. If they have, disgard all the robots that have collided and place a pile of junk at the locations they occupied. Check if any robots remain. If not, end the game and mark the player the winner. Let’s take on each of these tasks in turn. Be sure to modify the call to check_collisions (currently defeated = check_collisions(robots, player)) to include junk as a new argument. Since at this point junk is always an empty list, we haven’t changed the behavior of our program. To test whether our new logic is actually working, we could introduce a single junk pile and run our player into it, at which point the game should remove all items from the screen and display the ending message. Notice that x and y are now parameters, along with a new parameter that we will use to set filled to true for piles of junk. Our program is now broken, since the call in place_robots to place_robot does not pass arguments for x and y. Fixing this and setting up the program for testing is left to you as an exercise. Running this new code with the program as setup in exercise 11, we find a bug. It appears that the robots continue to pass through the pile of junk as before. Actually, the bug is more subtle. Since we have two robots on top of each other, when the collision of the first one is detected and that robot is removed, we move the second robot into the first position in the list and it is missed by the next iteration. It is generally dangerous to modify a list while you are iterating over it. Doing so can introduce a host of difficult to find errors into your program. The solution in this case is to loop over the robots list backwards, so that when we remove a robot from the list all the robots whose list indeces change as a result are robots we have already evaluated. will make our program work the way we intended. We now want to check each robot to see if it has collided with any other robots. We will remove all robots that have collided, leaving a single pile of junk in their wake. If we reach a state where there are no more robots, the player wins. Once again we have to be careful not to introduce bugs related to removing things from a list over which we are iterating. Check each robot in robots (an outer loop, traversing forward). Compare it with every robot that follows it (an inner loop, traversing backward). If the two robots have collided, add a piece of junk at their location, mark the first robot as junk, and remove the second one. Once all robots have been checked for collisions, traverse the robots list once again in reverse, removing all robots marked as junk. Check to see if any robots remain. If not, declare the player the winner. We make use of the enumerate function we saw in Chapter 9 to get both the index and value of each robot as we traverse forward. Then a reverse traversal of the slice of the remaining robots, reversed(robots[index+1:]), sets up the collision check. It is not at all unusual for data structures to change as program development proceeds. Stepwise refinement of both program data and logic is a normal part of the structured programming process. After robot1 is marked as junk, we add a pile of junk to the junk list at the same location with junk.append(place_robot(robot1['x'], robot1['y'], True)), and then remove robot2 from the game by first removing its shape from the graphics window and then removing it from the robots list. The next loop traverses backward over the robots list removing all the robots previously marked as junk. Since the player wins when all the robots die, and the robot list will be empty when it no longer contains live robots, we can simply check whether robots is empty to determine whether or not the player has won. Hmmm... What should we return? In its current state, check_collisions is a boolean function that returns true when the player has collided with something and lost the game, and false when the player has not lost and the game should continue. That is why the variable in the play_game function that catches the return value is called defeated. A few corresponding changes need to be made to play_game to use the new return values. These are left as an exercise. A collection of key-value pairs that maps from keys to values. The keys can be any immutable type, and the values can be any type. A mapping type is a data type comprised of a collection of keys and associated values. Python’s only built-in mapping type is the dictionary. Dictionaries implement the associative array abstract data type. A data item that is mapped to a value in a dictionary. Keys are used to look up values in a dictionary. One of the pairs of items in a dictionary. Values are looked up in a dictionary by key. Temporary storage of a precomputed value to avoid redundant computation. A signal such as a keyboard press, mouse click, or message from another program. A programming construct that waits for events and processes them. A numerical result that is too large to be represented in a numerical format. $ python letter_counts.py "ThiS is String with Upper and lower case Letters." Adds quantity of fruit to inventory. Your solution should pass the doctests. How many times does the word, alice, occur in the book? What is the longest word in Alice in Wonderland ? How many charactes does it have? Copy the code from the Setting up the world, the player, and the main loop section into a file named robots.py and run it. You should be able to move the player around the screen using the numeric keypad and to quit the program by pressing the escape key. Laptops usually have smaller keyboards than desktop computers that do not include a seperate numeric keypad. Modify the robots program so that it uses ‘a’, ‘q’, ‘w’, ‘e’, ‘d’, ‘c’, ‘x’, and ‘z’ instead of ‘4’, ‘7’, ‘8’, ‘9’, ‘6’, ‘3’, ‘2’, and ‘1’ so that it will work on a typical laptop keyboard. Add all the code from the Adding a robot section in the places indicated. Make sure the program works and that you now have a robot following around your player. Add all the code from the Checking for Collisions section in the places indicated. Verify that the program ends when the robot catches the player after displaying a They got you! message for 3 seconds. Modify the move_player function to add the ability for the player to jump to a random location whenever the 0 key is pressed. (hint: place_player already has the logic needed to place the player in a random location. Just add another conditional branch to move_player that uses this logic when key_pressed('0') is true.) Test the program to verify that your player can now teleport to a random place on the screen to get out of trouble. Make all the changes to your program indicated in Adding more robots. Be sure to loop over the robots list, removing each robot in turn, after defeated becomes true. 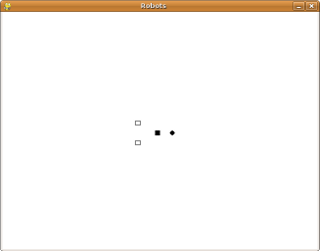 Test your program to verify that there are now two robots chasing your player. Let a robot catch you to test whether you have correctly handled removing all the robots. Change the argument from 2 to 4 in robots = place_robots(2) and confirm that you have 4 robots. When you run this program and either stay still (by pressing the 5 repeatedly) or move away from the pile of junk, you can confirm that the robots move through it unharmed. When you move into the junk pile, on the other hand, you die. Rename defeated to winner and initialize it to the empty string instead of False.